BBC NEWS | UK | Where are all the women judges? Where are all the women judges? Women and ethnic minorities are noticeable by their absence from the ranks of the country's top judges. 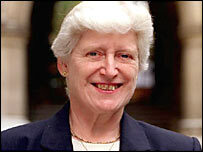 BBC News Online asked Lady Justice Arden, an appeal court judge, what can be done to increase their presence. She said inflexible working hours and a lack of openness about appointments were deterring a number of talented lawyers who are women or from ethnic minorities from becoming judges. And she warned it could take years for diversity in the top levels of the judiciary to increase. 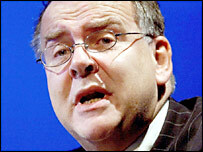 The Lord Chancellor, Lord Falconer, said this week that it was "one of his priorities" to ensure judges in England and Wales reflect the society they serve. Only 7% of High Court judges are female. At present only 15.4% of court judges are women and just 3.4% come from ethnic minority groups, with the proportions dropping in the higher echelons. Of 107 High Court judges only nine are female, while just one of the 12 Law Lords - the most senior judges in the UK - is a woman. "Clearly the numbers of women and ethnic minorities are less than you might expect and less than you would hope for," Lady Justice Arden, 57, said. She believes setting up an independent judicial appointments commission - a proposal in the Constitutional Reform Bill before the House of Lords - is essential. "It would be a more transparent process than we have at the moment. That's a very important change and it will enhance the confidence of women and ethnic minorities who want to apply." The Association of Women Barristers blames the "old boys' network" for problems with the selection of judges. Too many appointments are made "over a glass of brandy" in gentlemen's clubs, chairwoman Jane Hoyal told BBC News Online. It was "embarrassing" that the UK lagged so far behind countries like Canada, where a third of senior judges are women, she said. "It's in the public interest to have a judiciary which reflects society and in which people have confidence." She warned that the kind of attitudes which saw appointment committees take into account comments like "she's too headmistressy" or "she doesn't dress well enough" needed to change. The Fawcett Society, a gender equality campaign group, also points the finger at the judicial appointment process. Director Katherine Rake said: "It has operated very much as an old boys' network for many years, so a lot of the barriers that stand in the way of women stand in the way of ethnic minorities as well. "We are proposing a system based on merit that really enables women and black and Asian lawyers to come forward and progress. "It's not about special favours, it's about making sure the system is properly merit-based rather than 'he's quite a nice chap, he belongs to my club, I enjoy having a drink with him'." A judge since 1993, Lady Justice Arden does not feel the "old boys' network" hindered her own appointment but agrees that reform is needed. She quotes Canadian chief justice Beverley McLachlin, who said: "Human beings have a tendency to see merit only in those who exhibit the same qualities that they possess, so psychologists tell us. "Senior lawyers are no exception, so when they look for merit they tend to look for someone like themselves." Lady Justice Arden went on: "I don't think this happens all the time but I think this is part of the explanation." She said one of the chief obstacles for women solicitors was the "enormous pressure" on them to work as many hours as the men, even if they wanted to do some part-time judicial work to gain experience for a more senior appointment. Herself a mother-of-three, Lady Justice Arden believes the regular working timetable of a judge suits family life better than the gruelling hours expected of barristers or solicitors. But few women make the step because so many leave the profession to fulfil family commitments before they gain enough experience to apply to be a judge. "If you are doing two jobs at once [mother or carer, and lawyer] obviously it's probably as much as you can do to keep pace with your practice," she said. Lady Justice Arden hopes the introduction of part-time working for judges below high court level - starting next April - will turn the tide in women's favour. The judiciary must reflect society in including all elements, she said, if it is to be viewed as fair. "If you had a woman judge a case and a man judge a case you would be likely to have the same conclusion on the case. "But you have to remember that people coming into the court want to have confidence in the Bench - and if they enter a court and see it's just men, they will have less confidence." Why are there so few women judges?